Like many other heavily processed foods, American “cheese food” slices seemingly last forever. They’re like the undead of the deli drawer. But real cheese is a living, breathing thing. One that needs to be tended if it’s to have any longevity. Here are some ways to help your cheese live its life to the fullest. And recipes for enjoying every last bite. Buying cheese from a cheesemaker or skilled cheesemonger is a sure way to get the good stuff. But if you are selecting from an untended counter or the refrigerated section at the grocery store, there are some rules of the road that you can follow to find the finest on offer. Cheese that is wrapped should be wrapped well. Make sure there aren’t any tears or holes that leave the cheese exposed to air. Shrink wrap should be tight, not loose or puffy, which indicates that it has been compromised. If the wrapper is clear, check that there isn’t any moisture between it and the cheese. Look for mold that may have developed. Bloomy rind cheeses, such as brie and camembert, should have a core that is more solid than the layer of cheese closer to the rind. Such cheeses age from the outside in, so a solid core indicates that you have some time before it is past its prime. If you can, give the cheese a whiff. The smell of ammonia signals that the cheese is overaged. Blue cheese is, by its nature, veined with blue mold. Furry black or grey mold, however, is a sign of spoilage. Slick pink or yellow spots are a bad sign as well. While many cheeses are aged, that doesn’t mean that you can keep your wheel or wedge lingering in the fridge indefinitely. The process of aging cheese, also called affinage, is part art and also part science — it relies on carefully controlled temperatures and humidity. Cheese is nurtured along, often by regularly turning, brushing or systematically washing with brine, beer or liquor. Without these precise and meticulous methods, cheeses will not reach their full flavor potential and, in the worst case, will spoil. You probably won’t go to such great lengths to baby your cheese at home, but there are some things you can do to prolong its flavor and shelf life. Many cheeses are sold in plastic wrap, but that actually shortens the shelf life of the cheese which needs to breathe. When you get home, rewrap cheese in waxed paper or foil. Or, if you want to take it to the next level, you can find specially designed, cheese paper sold in gourmet shops. These all allow a little air to circulate while preventing cheese from drying out. If you have the space for it, create a little “cheese cabinet” in your refrigerator. This can be as simple as a pie dish large enough to hold your cheese selection covered with a plate or a lidded box specially designated for this purpose. Keeping all of your wrapped cheeses stored together in this kind of container maintains humidity which preserves freshness and flavor and keeps the aromas of stronger cheeses from taking over your fridge. Cheese that is meant for cooking, such as firm cheeses and cheese rinds (see below), can be wrapped well and frozen for up to six months. Never freeze cheese destined for the cheeseboard. Doing so will not only impact its flavor, the texture of the cheese will become unappealingly crumbly. The shelf life of refrigerated cheese depends on careful storage but also the type of cheese you have on hand. 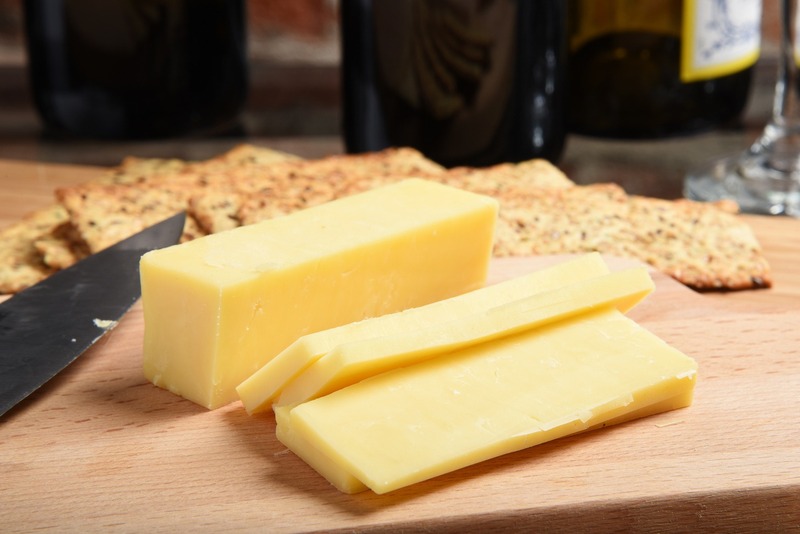 Harder cheeses, with their low moisture content, last the longest, while softer cheeses need to be eaten faster. There is some debate about the safety of eating cheese that has begun to mold, once the mold has been cut away. The traditional rule of thumb is that hard cheeses prevent the spread of mold spores and once the mold is removed, the cheese can be enjoyed. Be sure to cut a nice margin of a half inch or so. Softer cheeses, however, allow mold spores to spread throughout readily and cannot be rescued in the same way. The variety of mold also comes into play. White, green or grey mold is widely considered relatively benign. However, red, brown and black molds are considered more toxic. Cheeses of any variety exhibiting mold of these colors should be discarded. My cheese drawer is never empty. Often it has a few ghosts of cheese dishes past rolling around. The rind from a wedge of Parm, the remnants of a cheese plater, some cheddar that didn’t make it into the mac. Or, fresh from the shop, it’s groaning with wheels and wedges that are facing a ticking clock. Either way, it’s time to cook! The easiest way to use up the rind from a hard cheese such as Parmigiano-Reggiano is to toss it in your soup pot. The savory, umami flavor (often described as the fifth taste) fills out the corners of your taste buds. It brings body and soul to even the thinnest of water-based soups. Not making soup? Simmer your rinds in a quart or two of water to make a rind stock that you can cool and freeze. Add it to simmering dishes that could use a little gravity and grounding to round them out. This little trick for turning cheese scraps into a French cheese spread is a favorite of the sophisticated yet frugal cook. Outside of waxy or cloth coverings or the hard-as-a-rock rinds that you use to make stock (see above) you can blend in any little cheese bits you have on hand. Pieces that may have dried out a bit on the cheese board are fine. Even the bloomy rind left behind by the brie-excavating guest. (See below for recipe or click on the video). You could say that these are variations on Fromage Fort. But you would be risking a violent response from your English Pub Cheese inventors, or Southern friends, who are squarely team Pimento. Both use a large block of cheddar, bound with a bit of something creamy and spiked for flavor. But each is distinctive in its own right (and equally welcome on Game Day). There isn’t a quiche around that doesn’t benefit from a bit of cheese added in. Swiss and ham, cheddar and broccoli, goat cheese and anything, or a combination of a few. Skip the red sauce for a turn and load up your pie with cheese and more cheese. Try different combinations, perhaps blending a mild and a strong cheese for contrast. Even blue cheese is fair game here. Pair it with something sweet like figs or balsamic vinegar or both. Slice it into two inch squares for an easy cocktail nibble. A morning with freshly made biscuits is a good morning. One filled with cheese biscuits is even better. You can use any variety of cheese that you have in your drawer. Just add it to your biscuit dough, maybe with a pinch of pepper or some herbs to throw over the top. Jam added to a cheese biscuit is an eye-opening pairing — like cheese and chutney — the savory/sweet combo is better than the sum of its parts. These “sausages” kill two leftover birds with one stone. You can use up some cheese and stale bread all in one great tasting dish. The traditional Welsh recipe calls for cheddar, but any shredding cheese would taste great. White wine is traditionally used to bind this spread together, but I prefer the nutty, warm flavor of sherry. Add cooked vegetables, such as mushrooms, roasted root vegetables, or a few slices of olive to fromage-fort-topped crostini and heat in the broiler for a quick hors d’oeuvre. With the food processor running, (fitted with a chopping blade) drop in the garlic clove to mince. Add the cheese and butter. Blend. Add the wine or sherry and the thyme (if using), and blend again. Season with salt and pepper to taste. Scrape into a ramekin and cover. Refrigerate at least overnight and for up to a week.